Oscar Isaac has revealed that some of the unused Carrie Fisher footage from The Force Awakens made it into Star Wars 9. Without going into too many details, Isaac says that some of that footage revolves around the growing bond between General Leia Organa and Poe Dameron. Fisher sadly passed away at the end of 2016 and Star Wars fans were wondering how the final installment in the Skywalker saga would handle her death. When Star Wars 9 was officially announced with J.J. Abrams in the director's chair, Lucasfilm also announced that they would be using previously unused and unseen footage of Carrie Fisher from The Force Awakens and The Last Jedi to put Leia in the movie. The studio was dead set against the idea of using digital effects to bring the character back to life on the big screen. Oscar Isaac had this to say about the unused footage making it into the movie and if he was surprised that there was so much. "I wasn't surprised because I remember we were doing that, we worked a lot. (Fisher) and I worked together so much. We would talk about the scenes, and we got very tight during the shooting of that. So it was a beautiful thing to see, and it gets carried over into the new film as well." 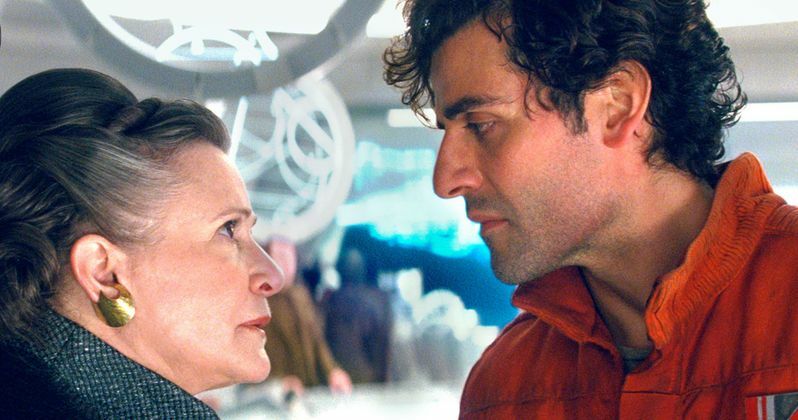 Oscar Isaac went on to say that the unused Carrie Fisher footage in Star Wars 9 further details the bond being forged between General Leia Organa and Poe Dameron. As far as pulling off the acting opposite the old footage, Isaac says it was, "definitely an unusual thing." However, in the end he says, "I also think it was right to engage with her character, and not just let it be something that fades away." As for using the unused Carrie Fisher footage from The Force Awakens and The Last Jedi, J.J. Abrams made sure to get permission from Fisher's family beforehand. Fisher's family, including her daughter, Billie Lourd, were okay with her image being used in Star Wars 9 and are more than likely happy that it was never an option to recast the iconic character with a new actress or use technology to bring her back. It definitely sounds like Abrams and Lucasfilm are doing the right thing with the footage that they have left over. Related: C-3PO Plays a Big Role in Star Wars 9, Is It the Droid's Last Go? Todd Fisher, Carrie's brother, recently revealed that the unused footage isn't just some random outtakes. Fisher says that there are minutes of footage that can be put together to further the story of Star Wars 9. Whatever the case may be, we still have quite a while to wait before the movie hits theaters. Until then, we're all still waiting on the official title and first teaser, which should be released next month at the Star Wars Celebration in Chicago. You can check out a portion of the Oscar Isaac interview below, thanks to the Sirius XM Insight Twitter account.